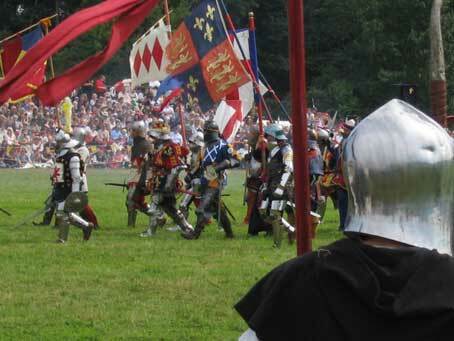 After a brilliant but very hot weekend at Ashby de la Zouche Castle we are now really on a roll with the events and hols and will be off to Tintagel in Cornwall soon followed by North Wales then Spain for sitting in the jacuzzi with bubbly stuff! Big thanks to the group for their support this weekend – especially to Kerry for coming all the way to get me and Jake and bring us back on Sun. Ellie has come back from Kosovo and has a a really good time – lots of social events as well as the work with the kids. The pics below are from the event we did two weeks ago at Tewkesbury – you can’t really see clearly from the second pic but the King has the most fabulous goldwork on his surcoat. I love this event as it is such an amazing sight with all the armies and flags and the sheer scale of the market etc. I love, love, love re-enactment and can’t wait for the next two events – especially Bodelwyddan as that will be really special. I will be so sad when the season ends in September but at least I have Nepal to look forward to! Well Jake is safely in bed in his new room at last – have spent all day building flat pack furniture with him and finished putting up the curtains at 9pm. Still got to have some furniture delivered on Fri and put up posters and move all important gaming chair, Nintendo and Wii back in but is done. Big hugs to the kids for this as they have been fantastic – Ellie painted loads last week and Jake is a dab hand with a screwdriver. And I got to use my new power drill – liberation! I didn’t think it would get done ever but it has – now only the rest of the trashed house to fix! However it will get done and we will get there. Ellie has gone to Kosovo on her youth education project and she has texted to say she is enjoying it. She is a star and deserves extra big doses of future happiness for the support she has given me and Jake. Jake thanked me tonight for getting his room done – he is such a sweetie. Am having trouble uploading pics of the new room due to technical problems at the blog end but here is one bit. 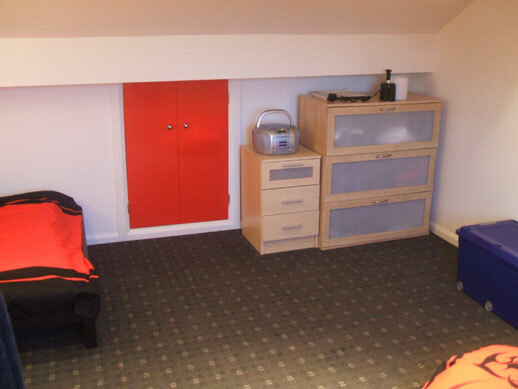 It is a hard room to photo anyway being an L shape attic and in this pic the carpet looks a bit strange – looks better in real life and Jake really likes it – colour scheme is his choice. Anyway will not be posting for a little bit as have a busy week ahead sorting out stuff ready to be away lots – have three events in next few weeks and a holiday in Spain – mother has just e-mailed me a pic of her in the jacuzzi – can’t wait. Life is good. Sad things happen but they are outweighed by the kindness of everyone else. 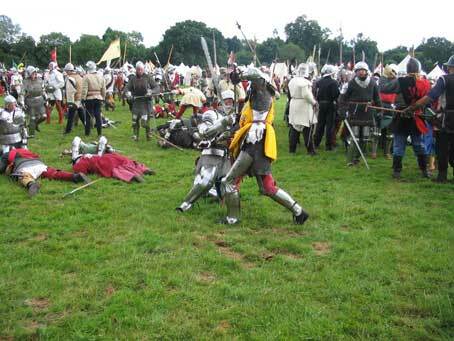 Well the Tewkesbury event was wonderful, weather was not too bad – rain on and off on Sat especially while we were waiting to go into battle which led all the boys to moan about rust – lots of WD40 needed. My brother took loads of brill pics so will try and get them from him. On the domestic front have done little except try and paint so poor Jake can have a bedroom again – carpet is coming tomorrow and then will do furniture building Fri and Sun so he can move in then. Then on the bathroom! Lucky I am an independant woman who knows one end of a screwdriver from the other though I am going to have buy my own power drill now. Will try and take pics of finished build so you can see all my hard work. I have had a very good day today with some lovely things happening. Today we had our end of year strawberry tea when all the staff gather to eat strawberries, chat and those who are leaving are given gifts and thanked. I went today particularly to say goodbye to one of my colleagues who started me off on my full time career at the University by appointing me to a research post many years ago and was delighted to find another old colleague from the past there as well. Peter was my old boss when I worked for the Adult Education Service, a lovely man who really supported me through my time there and who is responsible for developing my love of Numeracy teaching as he gave me my first class in that subject. I was so pleased to see him as he has just been appointed to a new post in our section to develop research and funding etc. It was a lovely blast from the past and a very nice new beginning for him and me. I will leave you again with some fabulous work – not mine again as I need to get things sorted and places decorated before I have the luxury of sitting down with a needle I’m afraid. The only information I have for this piece is that it is Swedish Blackwork though given that it is a black and white picture it could well be redwork but I really like the scrolling patterns on this.